Now that school's back in session and I don't have oodles of free time like I did over the summer, I miss my precious baking time dearly. Although I've been exhausted every night as I adjust to my new routine, I find that baking is a cathartic way to unwind when I come home from a long day. 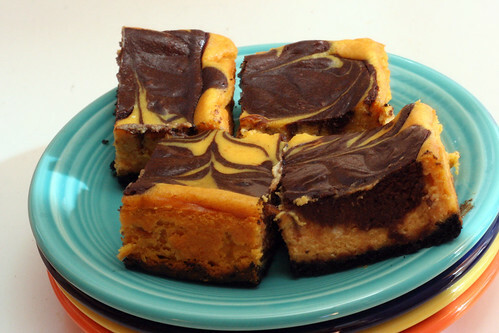 These Pumpkin Chocolate Cheesecake Bars could not be more fall-ish. A few people I shared them with said that they taste like Halloween. They're rich and decadent, but still have an airy, fluffy quality to them. They're the perfect tool to help oneself cope with the fact that summer is truly over. My grocery store didn't have chocolate wafer cookies, so I bought a pack of Oreos, and using a lifetime of experience, carefully separated them so I could use just the side with no filling for the crust. Then I used my kitchen scale to weigh out 4.5 oz. of halves. That, my friends, is love. But what in the world should I do with all of these? 1. Preheat oven to 350 degrees. Line bottom and sides of an 8-inch square baking pan with parchment paper or aluminum foil, leaving an overhang on all sides. Set aside. 2. In a food processor, blend cookies with sugar until finely ground (you should have about 1 cup crumbs); add butter, and pulse until moistened. 3. Transfer crumb mixture to prepared pan, and press gently into bottom. Bake until fragrant and slightly firm, 12 to 15 minutes. Set aside to cool. 4. Place softened cream cheese in food processor; blend until smooth. Add sugar, pumpkin puree, eggs, flour, pumpkin-pie spice, and salt; process until combined. Set aside. 5. Place chocolate in a microwave-safe bowl; microwave in 30-second increments, stirring between each, until melted. Add 1 cup of the pumpkin mixture; stir to combine. Set aside. 6. Pour remaining pumpkin mixture into prepared pan. Drop dollops of chocolate mixture onto pumpkin mixture; swirl with a butter knife. Bake until cheesecake is set but jiggles slightly when gently shaken, 40 to 50 minutes. 7. Cool in pan. Cover; chill until firm, at least 2 hours (and up to 2 days). Using overhang, transfer cake to work surface. With a knife dipped in water, cut into 16 squares. Serve. Oh wow those look good. I have to get some groceries today, and cream cheese may have just made it on my list. As for the leftover halves, chop 'em up and put 'em in some ice cream! Or maybe pulverize them and make icing. Mmmmmm. Leftover Oreos. Wowow I love the vibrant color of the pumpkin! Great contrast with the blacj of the chocolate! And, the most important thing, your bars sounds delicious! Oh my gosh, this made my day! That looks just amazing! And in my house....the leftover halves would be gone before I could even ask who wanted them but if you're lookign for a recipe I have a delicious oreo bar recipe that I could send your way! It uses chopped oreos so it'd be perfect! I say eat all of the leftover oreos. You never know which one may be your last =D. The bars look amazingly delicious too! These looks incredible!! I am loving the oreo cookie layer!! 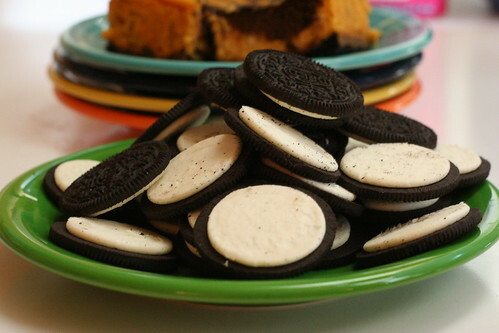 You should mash up those leftover oreos and put them on top of cupcakes! PS - I made a fig tarte tatin using your recipe and gave you a shout out! I've never tried a pumpkin cheesecake. Feel a little weird about veggies/squashes in my dessert - the most I'm willing to try is a pumpkin pie. I so want this to change! I just showed this to my husband, and he said, "I think those might be required this fall. Let me know what I need to do to make that happen." ha! I have been in same situation with Oreo halves... and I hate Oreo filling. Friends came to the rescue. Anytime a recipe calls for an oreo crust (or chocolate wafer crust) I just throw the whole lot into the food processor- filling and all. 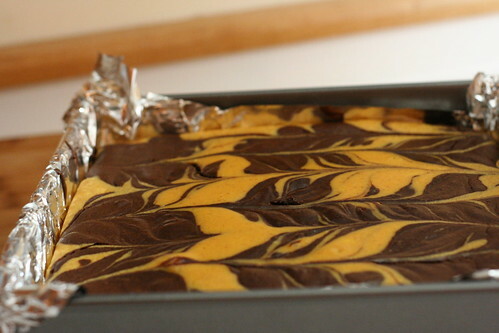 These bars look fantastic...I'm going to make them for the office this week. I MUST make these. Yum! Amy, I made these a couple of weeks ago, and just today posted them to my blog. I didn't post the recipe - I linked back to you instead. :) They were fantastic, thanks for the great recipe! I love pumpkin and chocolate. Those look so good. Gonna' have to try this one soon! never had a pumpkin chocolate, should have it soon!